Join us at our new spacious venue on Esten Avenue in Pawtucket! It’s a ground-floor, easily accessible, air-conditioned space with some couches and comfortable chairs around the walls and plenty of parking! 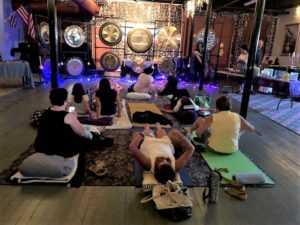 Immerse yourself in sound to clear, energize and balance each of your 7 energy centers, or chakras, through the deep vibration and resonance of the gongs. Your mind, body and spirit will attune to your deeper self – a state of profound relaxation and spontaneous healing. Leave with greater clarity, inner peace, and a connection to your inner truth and joy! Joy (Gongs of Joy) and Shawn Aceto (Master Sound Healer) are your guides for this harmonic journey! Bring a mat/pillow/blanket or folding chair…whatever you need to be comfortable. For more information, contact Joy at 401-258-3952 or email Joy@GongsOfJoy.com! All monies will be collected at the door – cash or check only please! Please contact Joy ahead of time if you plan to come! **GONGMASTER JOY is the sacred sound healing artist playing the Gongs of Joy! She played the gongs with The Resonant Voices of the Spheres for 6 years, and was a co-founding member of the original ensemble. Joy's teacher, Grand Gongmaster Don Conreaux, has been an inspiration and guide in helping her follow the Way of the Gong. Joy offers gong baths, private gong healing sessions, workshops, and other rituals in the southern New England area. ** In January of 2013, Joy and A. MICHELLE of Drumsong decided to become partners and join together in creating healing vibrations. A. Michelle channels sacred sound in harmony with a variety of indigenous instruments including Native American flutes, rattles and drums. **The women believe that by combining the sounds of the gongs and singing bowls with those of the indigenous drums, rattles, flutes and chanting, they create a blissful harmonic attunement for physical, emotional and spiritual well-being. These vibrational overtones create and hold a space where emotional stress release, chakra alignment, clearing of energy blocks and spontaneous healing is possible. © 2013 Gongs of Joy. All Rights Reserved.